Lake Tahoe directed by Fernando Eimbcke. Fernando Eimbcke's minimalist comedy Lake Tahoe presents a series of vignettes showing a small-town teenager (Diego Cataño) trying to cope with the death of his father. Lake Tahoe won three Ariels: best film, best director, and best supporting actor (Héctor Herrera). The night's biggest winner, however, was Rodrigo Plá's drama Desierto adentro, set during Mexico's Cristero War, with eight awards including best actor (Mario Zaragoza) and best original screenplay. 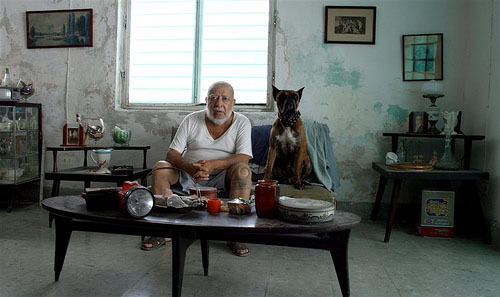 Box-office hit Arrancame la vida / Tear This Heart Out, Mexico's submission for the 2009 Best Foreign Language Film Academy Award, failed to get a best picture nod but managed to collect a total of four trophies, including Best Adapted Screenplay (it was the sole nominee in that category). Another box office success, Rudo y Cursi, starring Gael García Bernal and Diego Luna, failed to win a single Ariel out of its eight nods. Golden Ariel winner Fanny Kauffman was given a posthumous award, as the 84-year-old, Canadian-born, Cuban-raised comedienne died shortly after learning that she would be honored at the ceremony. 2009 Ariel winners: National Auditorium in Mexico City on March 31. Robert Redford – actor, filmmaker, political and environmental activist, and independent film festival creator – will be the recipient of this year's Peter J. Owens Award at the 2009 San Francisco International Film Festival on Wednesday, April 29, 2009, at 7:00 pm. at the Castro Theatre. The Robert Redford tribute will feature career retrospective film clips, audience Q&A, and an onstage interview with Phil Bronstein, editor-at-large of the San Francisco Chronicle. That will be followed by a screening of the film that turned Redford into a superstar, Butch Cassidy and the Sundance Kid (1969), directed by George Roy Hill, and co-starring Paul Newman and Katharine Ross. Among Redford's most notable films as a director are Ordinary People (1980), for which he won an Academy Award, and Quiz Show (1994). As an actor, his biggest hits include Barefoot in the Park (1967), with Jane Fonda; The Sting (1973), once again teamed with Newman, and for which he received a best actor Oscar nomination; The Three Days of the Condor (1973), with Faye Dunaway; All the President's Men (1976), with Dustin Hoffman; the prison drama Brubaker (1980); Out of Africa (1985), with Meryl Streep, and Indecent Proposal (1993), with Demi Moore. Although his latest film as actor and director, Lions for Lambs, with Tom Cruise and Meryl Streep, failed to connect with audiences in the US, it became a box office success elsewhere. Tickets are $20 for SFFS members and $25 for non-members. Tickets are on sale now to Film Society members whose memberships are valid through the end of the Festival. The 52nd edition of the San Francisco Film Festival, reportedly the longest-running film festival in the Americas, will be held from April 23-May 7, 2009. 2009 Asian Film Award nominations: Jan. 21. 2009 Asian Film Award winners: March 23. 2009 Jutra Award nominations: Feb. 17. 2009 Jutra Award winners: March 29. Ce qu'il faut pour vivre / The Necessities of Life, the 2009 winner of the Prix Jutra for best film, tells the story of an Inuit hunter (best actor winner Natar Ungalaaq) suffering from tuberculosis who is sent to a sanatorium in the Quebec City of the early 1950s. The hunter's condition is worsened by the clash of cultures, but a bicultural boy helps him to bridge the gap between the two different worldviews. Directed by Benoît Pilon from a screenplay by Bernard Émond (with Pilon's assistance), The Necessities of Life was Canada's submission for the 2009 best foreign-language film Academy Award and is up for 8 Genie Awards. Luc Picard's Babine (above), a magical-realist tale about a simpleton's life in a Quebec village, received the most nominations for the Quebec film industry's Jutra Awards – a total of nine nods. Yet, neither Picard (as director) nor the film itself were shortlisted. Among Babine's nominations were best actor (Vincent-Guillaume Otis), supporting actor (Picard), and screenplay (Fred Pellerin). Babine ended up winning five awards, including best score (Normand Corbeil and Serge Fiori). SUZANNE CLÉMENT - C'EST PAS MOI, JE LE JURE ! DANIEL BRIÈRE - C'EST PAS MOI, JE LE JURE ! PHILIPPE FALARDEAU - C'EST PAS MOI, JE LE JURE ! * ANDRÉ TURPIN - C'EST PAS MOI, JE LE JURE ! JEAN-FRANÇOIS CAMPEAU - C'EST PAS MOI, JE LE JURE ! TOD VANDYK, PETER LOPATA, JEAN-PHILIPPE ESPANTOSO - WHO IS KK DOWNEY ? MANON JOLY - C'EST PAS MOI, JE LE JURE ! * NEXT FLOOR - DENIS VILLENEUVE (PHI GROUP). Directed by Daniele Vicari, and adapted from attorney Gianrico Carofiglio's novel by Vicari, Carofiglio, Francesco Carofiglio, and Massimo Gaudioso, Il Passato è una terra straniera / The Past is a Foreign Land stars Elio Germano as a brilliant but bored law student who, after crossings paths with a card shark (Michele Riondino), is lured into the dangerous world of fixed decks. Based on a novel by Josef Kopta, Filip Rencs Guard No. 47 tells the story of Josef Dousa, a railway guard and World War I veteran who hopes to forget all the horrors he witnessed in the battlefield by spending his time with his young wife in a lone-standing guard house. Peace, however, is not in store for him. One day he saves the life of a young man about to jump under a train; while recovering, the young man falls in love with Dousa's wife. Any award given to Robert Redford is well-deserved. He is a fine actor and fine human being. But I beg to defer when you state that the role in Butch Cassidy made him a star. I think any red-blooded female will agree that The Way We Were was movie that made him pop into our collective female consciousness. But I've seen EVERY SINGLE FILM of Redford's including those he's directed and not one falls short of exceptional. Well done Bobby. Paul is laughing his head off up there and wishing he could send you another gag “item” to honor you as well.